Starfire, called just Star, only wants to be an average foal, but he stands out and not in a good way. He is a freak, with giant wings so large, ungainly and heavy that he cannot fly. More ominously, he is a black pegasus, and one of that color is only born once per century. According to ancient prophecy, a black pegasus is destined to grow up to become the most powerful pegasus in Anok, and will either unite or destroy the five herds. Nobody wants to see the herds destroyed, and none of the five individual over-stallions want to risk losing their leadership if the herds unite. The obvious solution is to kill Star when he reaches his first birthday and becomes a yearling; an equine Young Adult. Four of the over-stallions including Star’s own Thunderwing openly intend to do this, while Rockwing of the Mountain Herd, the over-stallion of the Sun Herd’s traditional enemy, offers Star a partnership if Star will unite the herds and make him co-leader. “But that’s not uniting; that’s conquering,” Star objects. Star is an equine adolescent, facing execution by his herd’s over-stallion when he reaches his first birthday. “The Hundred Year Star blazed next to the sun, visible even during the brightest day. It followed him, seeming to stalk him from space, and it grew larger every day. In seven cycles of the moon it would be winter and Star’s birthday. At midnight the star would drop low in the sky, transfer its fire to him, and transform him, maybe into a killer – if he lived that long.” (p. 14) Most of the pegasi of all the herds fear the black foal with the huge wings for what they believe he will become; their killer or their conqueror. Nightwing, a legendary black foal of four centuries ago, was friendly until his first birthday, “and then he’d turned on the herds, attacking them, setting their grasslands on fire, and driving them to the edge of extinction.” (p. 19) Most of the Sun Herd foals, led by Brackentail and Stripestorm, aren’t scared of him but take advantage of his unpopularity to torment him. Only the foals Morningleaf, Bumblewind, and Echofrost are his friends and playmates. The novel passes through the foals’ rites of passage: their weaning, the Sun Herd’s migration from their summer grazing lands to their winter pasturage, the dangers of forest fires and predators such as bears and cougars. As the foals grow toward their first birthday, Star and his friends are impressed by his maturing, but wonder whether the others really intend to execute him on his first birthday? There are signs that Rockwing’s Mountain Herd is planning to invade the Sun Herd’s lands. As tensions mount, some of the Sun Herd blame every misfortune as due to Star bringing bad luck. He exiles himself, both to bring peace to his herd and for self-protection. But, as the novel splits into parallel stories, both Star alone and the Sun Herd continue to experience dangers. The questions become: can Star survive on his own until he reaches and passes his first birthday, to get the Hundred Year Star’s fire and hopefully “grow into his wings”; can the Sun Herd survive until Starfire can return with his black-pegasus powers; and can Starfire control his power and protect his herd, or will he turn into an unthinking destroyer and annihilate it? The conclusion may surprise you. It’s an attractive book, although its pictures by cover artist David McClellan are small chapter headings, not full-page illustrations. 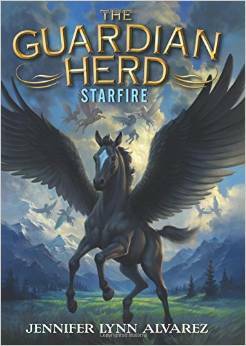 For fans of anthropomorphic and magic horses, especially those who want something more than My Little Pony: Friendship Is Magic, The Guardian Herd: Starfire should not be missed.